Okay let me start with, I liked Halflings. It's actually not a bad YA Paranormal book if you don't go with any expectations. I expected to like and enjoy it, which I did.. at least at first. Then it gets a little twisted and goes way off path, which I chose to ignore. Nikki is a standard heroine - not dumb, unaware of her looks and isn't really girly. She's not weak and she rides a motorcycle, which I have to mention because, well, it's pretty cool. I'm just thankful that she isn't another Bella. The story begins with Nikki being chased by a pack of wolves and Raven,Vine and Mace are trying to figure out how to keep her safe. These guys are all different and have their own personalities that make them unique. Their mission is to protect her, although they don't know why. What I liked about Halflings is that it had an unique idea, although it could've been carried out better. Nikki isn't weak and the best part of the book,if you ask me, was the inclusion of not one but three hot guys to crush on. The love triangle worked pretty well and I enjoyed the alternating points of view as it kept me interested. However, the book began with a lot of promise but the story went off track all of a sudden. I also felt that the characters could've been developed a little better, allowing us to know them deeper because while I liked them, I wasn't involved enough to care about any of the characters, including Nikki. Over all, the Halflings managed to keep me interested from start to finish despite the lack of smooth flow between the chapters. 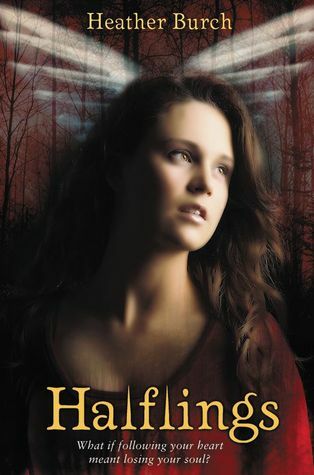 It may not be the next Unearthly series, but Halflings does have promise and I'm counting on Guardian to be better. I hope the second book is better too! I just finished reading this one and, while I enjoyed it, I do have my reservations about it as well. I have been waffling on reading this. Guess I still am lol. Wow, it sounds interesting. The guys have wings!!! Yay!!! I am so adding this to my too-read list:) Thanks for the review! Thanks for your thoughts. The things you mentioned are things I look out for in a book. It bugs me when the flow is thrown off.